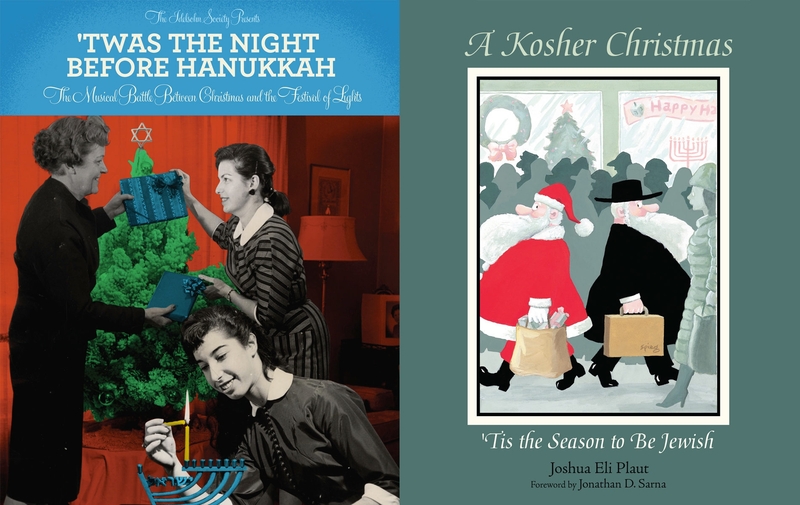 BOSTON (JTA) — From Kung Pao kosher comedy to a swinging Mardi Gras version of the “Dreidel” song, two new Chanukah season releases explore the intriguing, delightful and sometimes perplexing ways in which American Jews have responded to Christmas. In a book and an audio CD compilation, the holiday season known as the “December dilemma” is seen and heard in a new light. An added bonus: the covers of both are enticing and entertaining. In the book “A Kosher Christmas” (Rutgers University Press, $22.95) subtitled “’Tis the Season to be Jewish,” Joshua Eli Plaut offers a richly detailed, page-turning read that draws on historical documents and ethnographic research sprinkled with often humorous images and photos. In his introduction Plaut, a rabbi and scholar, admits to a lifelong fascination with Christmas. The son of a rabbi, he recalls as a young child growing up on Long Island in the 1960s that his mother dutifully took him to sit on Santa’s lap every December. “She was never worried about any influence on me as a child because my family was secure in its Jewish identity,” he writes. Plaut paints a historical portrait of the shifts in American Jewish attitudes toward Christmas — the only American holiday founded on religion, he notes. Jews have employed “a multitude of strategies to face the particular challenges of Christmas and to overcome feelings of exclusion and isolation,” he writes, adding that Jews actually have played a crucial role in popularizing Christmas by composing many of the country’s most beloved holiday songs. Plaut treats readers to a chapter on the popular Jewish custom of eating Chinese food on Christmas, a tradition that surprisingly dates back more than a century to Eastern European immigrants on the Lower East Side of New York. One photo shows a sign in a Chinese restaurant window that thanks the Jewish people for their patronage during Christmas. In the 1990s, comedian Lisa Geduldig hosted the first Kung Pao Kosher Comedy evening of Jewish stand-up comedy in a San Francisco Chinese restaurant on Christmas. Two decades later the event is still going strong and being replicated in cities across America. On a more serious note, Plaut reveals a long history of Jewish volunteerism on Christmas, serving the needy and working shifts for non-Jewish co-workers, allowing them to spend the day with family and friends. Plaut also covers the challenges faced by intermarried families at Chanukah and Christmas. He addresses as well the subject of public displays of religious symbols, with Jews on both sides of the issue. Jonathan Sarna, the American Jewish historian who wrote the foreword, cautions that the book should not be read merely as a story of assimilation. In a phone conversation with JTA, the prominent Brandeis University professor argues that if that were the case, the book would be about how Jews observe Christmas. Rather, Plaut chronicles how Jews demonstrate their Jewish identity through alternative ways of acting on Christmas that show them to be Jewish and American. Most significant, Sarna asserts, “A Kosher Christmas” is important because it portrays how two religions are transformed by the knowledge of the other. The CD, “’Twas the Night Before Hanukkah” ($15.99) is a lively and inspiring music collection gathered by the Idelsohn Society, a nonprofit volunteer organization that aims to celebrate a Jewish musical heritage that may be lost to history. The two-CD set includes 17 tracks for Chanukah and Christmas — some familiar and others that are lesser known. Performers on the Chanukah disc include Woody Guthrie, Cantor Yossele Rosenblatt, Flory Jagoda, Mickey Katz, the Klezmatics and Debbie Friedman. Among the voices that croon and swing on the Christmas disc are The Ramones, Theo Bikel, Dinah Shore, Sammy Davis Jr. and Benny Goodman. A 31-page booklet of liner notes is a fascinating read of short essays, notes on the songs and colorful reproductions of old Chanukah recordings. The project started as an effort to present a historical survey of Chanukah music, according to David Katznelson, a veteran record producer who is one of the four principals of the Idelsohn Society. Other members of the core group include Roger Bennett, Courtney Holt and Josh Kun. As their search deepened, they found noteworthy Chanukah recordings, Katznelson recalls, some by well-known performers, others by little-known singers and educators. But the group was most struck by the abundance of Christmas music by Jewish composers and performers. “The biggest Jewish names in music have at least one Christmas recording in their catalog,” they write in the liner notes. The group shifted the lens of their project to tell the full story “of how American Jews used music to negotiate their place in American national culture,” according to the liner notes. “This was an amazing way to look at Jewish identity in the 20th century, through a combination of the history of Chanukah recordings side by side with Jews performing Christmas songs,” Katznelson affirms. Some of the earliest Chanukah recordings appear in the 1920s and 1930s. By then, what had been a minor Jewish holiday through the later years of the 19th century had been transformed into a major celebration that was promoted by Jewish religious leaders and embraced by American Jewry. The emergence of Chanukah recordings parallels that transformation, Katznelson suggests. In the postwar 1950s, in addition to traditional songs, livelier recordings targeted children. On the Chanukah recording, Katznelson points to “Yevonim” (The Greeks) by Rosenblatt as the showstopper. Rosenblatt, a Ukraine native who immigrated to New York in 1912 at the age of 30, became known in the U.S. as the greatest cantor of his time. A Yiddish song about the Chanukah oil that burned for eight days, “Yevonim” opens with a chorus of women followed by Rosenblatt’s huge, haunting rich tenor full of color and warmth. Many will be surprised by Guthrie’s upbeat version of “Hanukkah Dance,” part of his 1940s collection of Jewish songs made for Moses Asch, founder of Folkways Records. “He can take anything and make it American,” Katznelson says of the late folk legend, whose centennial birthday this year is being marked by performances of his music across the country. Sure to be a party favorite is the version of “Dreidel” performed live by Jeremiah Lockwood, Ethan Miller and Luther Dickinson. The song was recorded live at a pop-up Chanukah record store concert hosted last year in San Francisco by the Idelsohn Society. At the end of the song, the trio takes off into the New Orleans classic “Iko Iko,” sung to the tune of “Dreidel.” The tune no doubt will get listeners off the couch, singing and dancing. On the Christmas CD, Katznelson is most drawn to Bikel’s little-known 1967 recording of “Sweetest Dreams Be Thine.” Bikel, the beloved Jewish folk singer and actor, performs the Christmas song moving between Hebrew and English. Katznelson says the society hopes the music conveys a deeper sense of Jewish history while raising questions that provoke conversation about the meaning of the holiday music. Some may hear familiar songs in a new perspective, he says.